Worlds as I remember it. 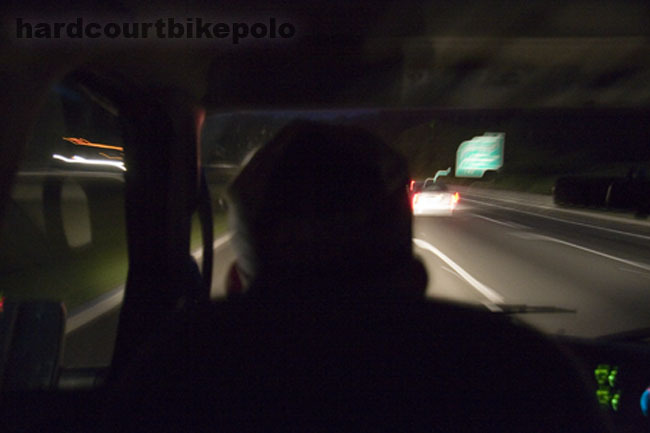 We left New York around 8pm Friday and got to Toronto about 5:30am Saturday morning. Good thing we had Red Bull as a sponsor. 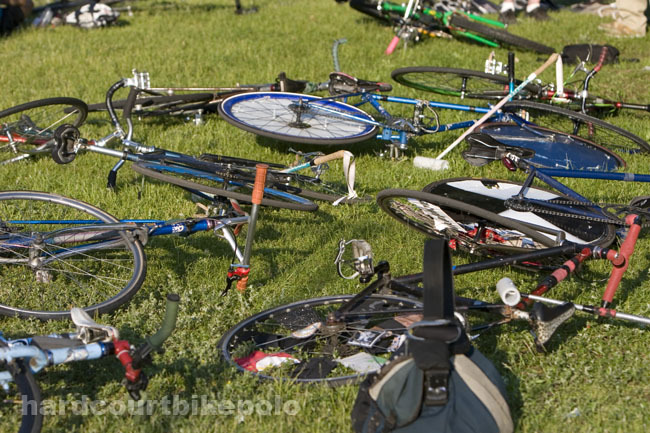 After about an hour of sleep we all got to the island and the polo area looked like this for the next two days. This is my friend Nick from Dayton, he stood still while I took his photo. 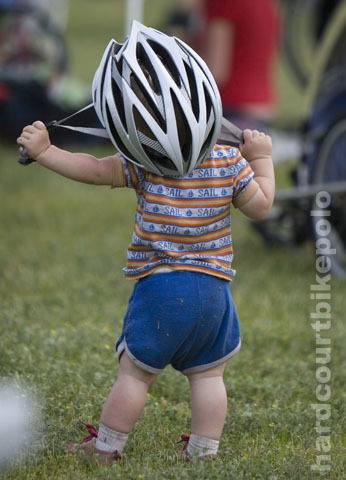 The heads running the CMWC said everybody had to wear helmets. 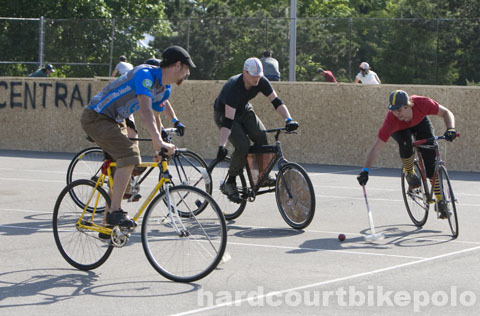 Some bike polo was played, some people got schooled. By Jen. 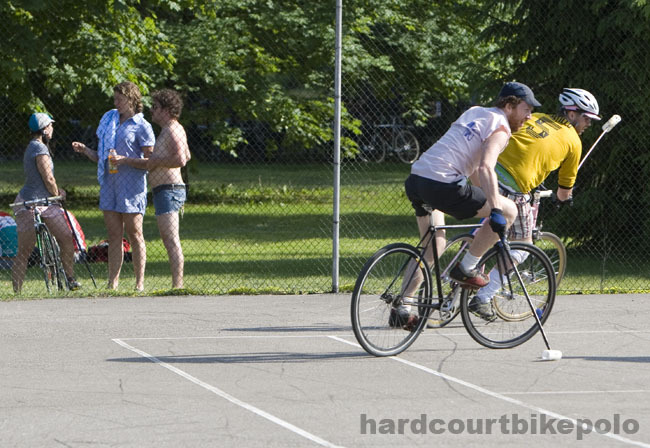 But while some people played polo, some other people just hung out. This is Zach. 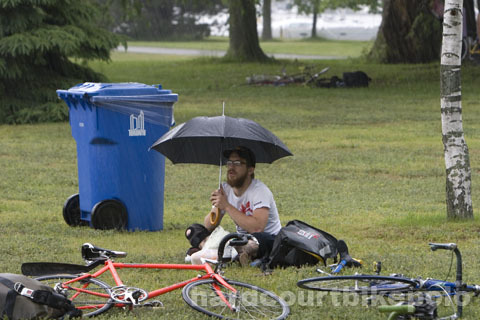 As it was raining I had time to remember that if our team name wasn’t Doug and the Darlrymple’s it was going to be Zach and the come guzzlers. This was cool. 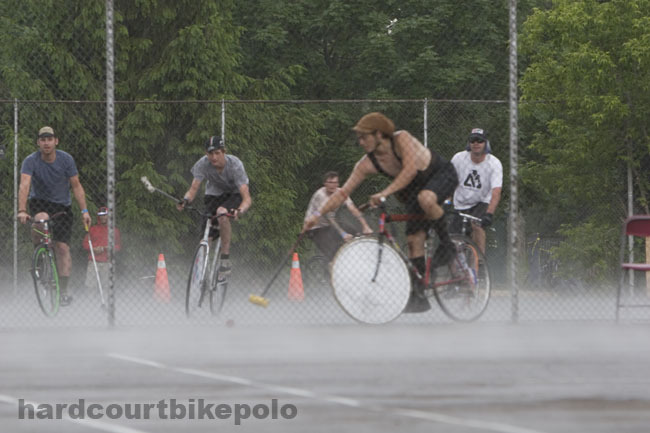 As it was raining the courts steamed and a bunch of people took pictures, I did too. 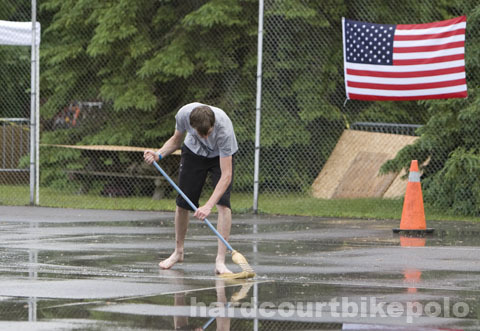 When it stopped raining this guy got out there and swept the water off the court. I just kept taking pictures. This is Graham. 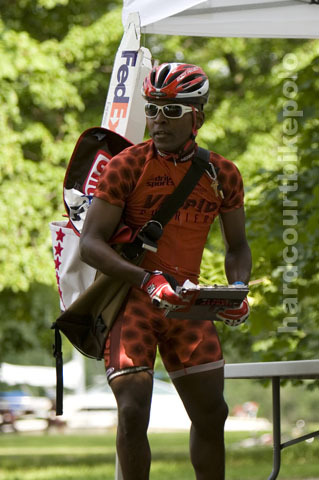 Somebody told me he threw a race once. 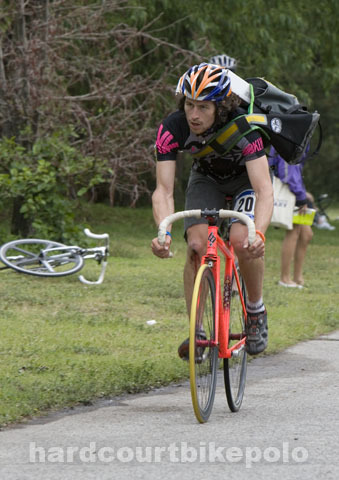 And of course what would a CMWC be without a race. Here is Shino killing it, nobody around. Actually, Shino is a pretty good looking dude. Here’s a better look. Style? Yes. Good looks? you be the judge. Here’s Austin racing for Brooklyn Machine Works and King Kog. 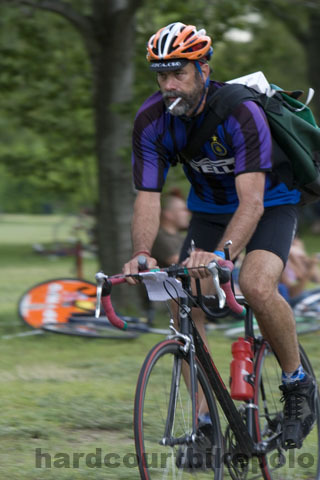 Here’s another NYC messenger, Jersey Dan. He’s riding for Six Racing. fast and for himself! 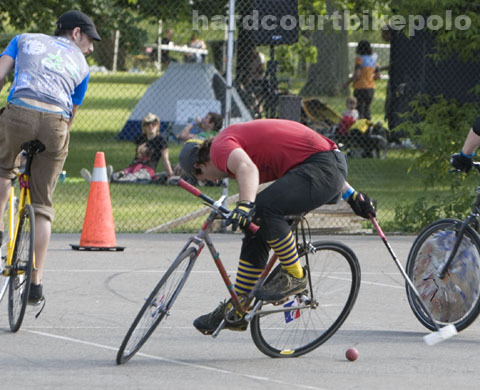 This is a DC courier and bike polo player. Everything I’ve ever heard about Bruce points to him being damn fast. 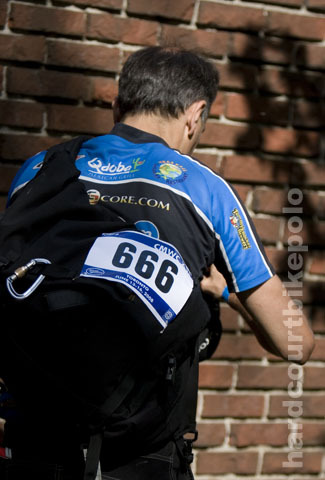 I don’t think they had six hundred and sixty six racers, but who better to bear racer number 666. Lucas Brunelle everybody. After the race we got back to polo but the 5 hour break in tournament play made it a little hard for some to remember how to do things. 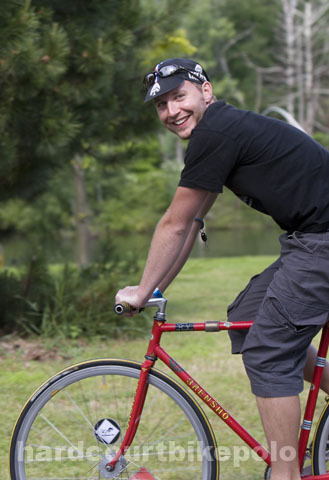 Here’s Ben Hunter doing it all wrong. 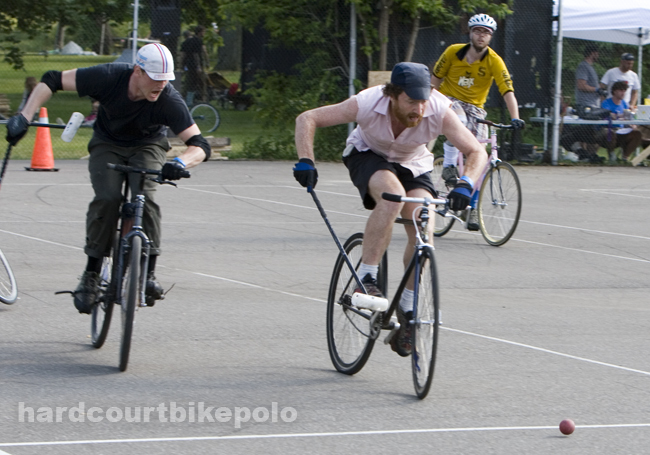 One more photo of bike polo just for good measure. Ben, Kev and Tucker. 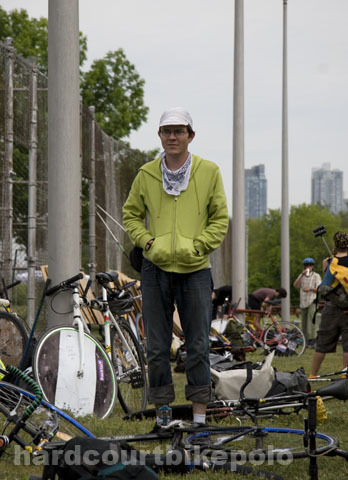 OK, That was great but to read and much better report check out Mess Media’s CMWC 2008 report. 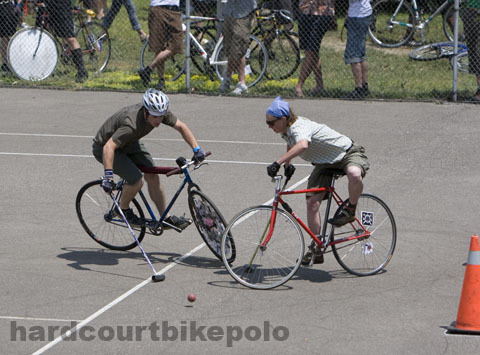 This entry was posted by Doug D on June 22, 2008 at 12:01 am, and is filled under Bike Polo, Events-Past, Game Play/ Action Shots, Ontario, Past Polo Events, Photos. Follow any responses to this post through RSS 2.0. You can leave a response or trackback from your own site. 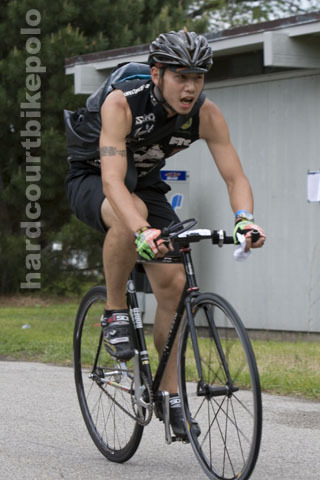 hey dude i just kinda ride for my self right now except for legit road racing in which case i ride for Kissena. 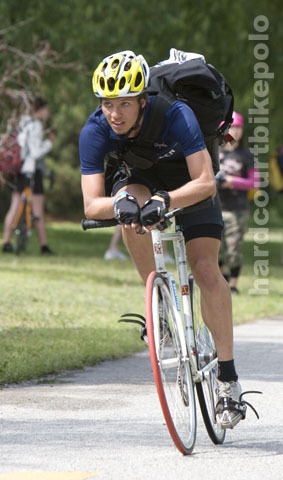 ps awesome race photos btw. I love that photo of us in the mist. For some reason I look goddamned fat, but I can assure you all that it is my faithful R.E.load hip pouch. and beer.